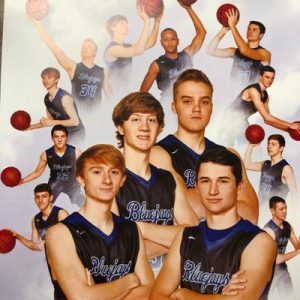 The Bondurant Farrar Bluejays Boys basketball team entered this season with a lot of question marks considering the Bluejay hoopsters were going to have a lot of new faces within the varsity rotation. Even though the record of 10-12 was not an outstanding mark, this group exceeded expectations by winning 10 games. They had some big wins, first over eventual third place finisher at the state tournament Winterset Huskies, second a big come back road win after being down 15+ at Creston and third again coming back from a big deficit at Nevada to hit a game winning shot in the closing seconds. 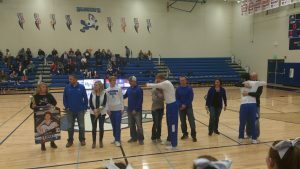 The Bluejays received the 3 seed in the substate format and defeated 6th seeded Nevada 59-47 in the first round. The Bluejays then took state tournament bound Ballard (2 seed) to the wire the last game of the year, eventually falling 39-47. These guys never gave up and played with great effort each night! The team graduates four seniors Jordan Collins, Connyr Duden, Jalen Kruse and Mason Storey, they will be greatly missed. Seniors Jordan Collins, Mason Storey, and Jalen Kruse all earned All-conference honors, with Collins getting 2nd Team and Storey/Kruse earning Honorable Mention. This year’s team can be proud of what they accomplished!